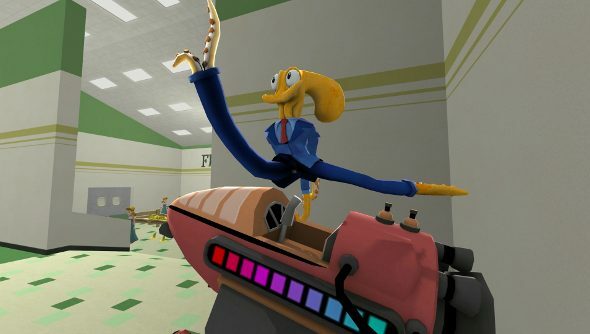 Despite being one of the most bizarre niche games of the year, Octodad: Dadliest Catch seems to have happily secured itself quite a following. Developer Young Horses has been nothing but supportive of their game, regularly throwing out updates. This weeks patch is quite a net-full: two new levels and support for co-op, as well as the expected fixes. Since Octodad doesn’t work like any game you’ve ever played before, you can probably already imagine that the game’s version of co-op play isn’t quite the usual. The same-screen multiplayer option allows you to plug two mice into one PC for dual player flopping around. The two additional levels are self-contained ‘shorts’ that can be free-played separately from the main story. Talking of the story, there’s now a timer mode for speedrunners, a new UI indicator to show how many collectable ties still remain in the level, and ‘ghost ties’ that replace the collectables when picked up. For a free patch, this certainly adds a great deal of value to a short and sweet little adventure that otherwise may well have provided little replay incentive for many players. That co-op addition may well be the second wind Octodad needs to get plenty of gaming duos re-installing.